Ferndale, MI – Established this year, the Jerry Olli Scholarship will honor Jerry Olli, a Ferndale Elk and a former Chairman of Michigan State Drug Awareness program, South Oakland Coalition, and Ferndale Youth Assistance board member of many years. 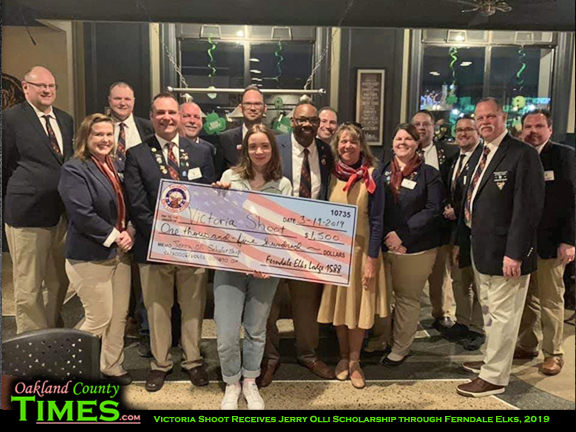 The Ferndale Elks members decided to create a scholarship in Jerry’s name to celebrate many years of his involvement and contribution in local youth. By following Mr. Olli’s footsteps the Elks are hopeful to continue Jerry’s tradition of selfless giving. Year after year Jerry made difference by continuous involvement in the community and betterment of local families. Victoria Shoot and Tony Weber, both of Ferndale High School, received this year’s awards. They each received $1500 towards their education. They were chosen because of their exceptional grades, extracurricular involvement, work ethic, local involvement, and of course their appreciation and desire for higher education. Victoria Shoot is a senior at Ferndale High School. She ranks 4th in her class. She is the Treasurer of the Student Council, a member of the National Honors Society, and a member of the National Thespian Society. Her family has lived in China for eight years due to her father’s ESL (English as a Second Language) teaching career. She is one of seven children in her family, two of whom were adopted. She recently started in Ferndale High’s production of The Addams Family as Morticia Adams. Victoria has plans to go to Oral Roberts University in Tulsa, Oklahoma. Her major is undecided at this moment but has an interest in International Affairs. Victoria is fortunate to have an older sister who attends Oral Roberts, and she has family that lives in Tulsa. She states that she plans to get involved in the local community. Toby Weber is a senior at Ferndale High School. He ranks 3rd in his class. He is President of the Student Council, captain of the Varsity Swim Team, Co-captain of the FIRST Robotics team, which he is particularly proud of, and has earned a varsity letter for the Cross Country Team. He is also a member of the National Honors Society. Toby has plans to attend the University of Michigan: Ann Arbor to pursue a degree in nursing. He chooses nursing be- cause he loves the idea of helping others. Nursing provide that hands-on approach with patients that he is seeking. The Jerry Olli Scholarship Committee has pledged to continue its efforts to increase the awareness of the scholarship foundation. The committee will continue its mission to have a larger impact on the community and youth. 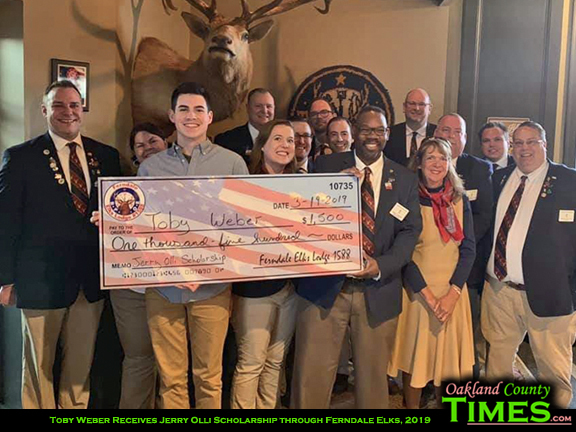 While currently the scholarships are fully funded by Ferndale Elks through fundraisers and grants, there is hope in finding new donors and contributors from local businesses and private citizens. Please contact Ferndale Elks Lodge #1588 to learn how to become a sponsor or how to get involved in the scholarship fundraisers. Jerry turns 90 years old on May 20, and is celebrating with his friends at the Elks on May 11 from 4-7pm. Ferndale Elks Lodge is located at 22856 Woodward Avenue. For more information check out their website http://www.elks1588.com/.